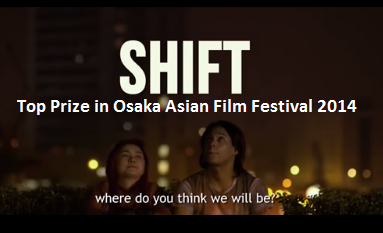 The movie entitled "Shift" wins as Top Prize in Osaka Asian Film Festival 2014 which was the first ever big-screen project of Yeng Constantino. The movie was directed by Siege Ledesma with the main cast were Constantino as call center agent Estela and Felix Roco as Estela gay mentor. Shift was name as the Best Picture on Osaka Festival beating 10 other entries from 6 other countries who joined the Film Festival. The movie tells the story about unconventional relationship between a call center agent and her gay mentor. The people beyond the film, as top prize on the film festival, will be receiving 500,000 yen or equivalent to more or less 220k pesos. Film festival is created to show the excellent works of film industry from Asia. There are some fine pieces of film work with good potential among films made in Asia although they are not shown very often. This Osaka Asian Film Festival was ran from March 7-16, 2014. This news was published at ABS-CBN News. This was again an another step on making Philippine film industry popular and encourages more the film making body to strive more in creating good films on this country. This achievement will gives more opportunity for all good film artist. We were hoping that this will success will continue for more years to come.